Thomond Park Meetings & Events Centre offers a comprehensive range of modern conference and hospitality facilities. 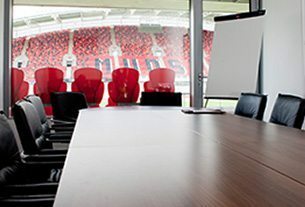 The versatility of our event suites makes Thomond Park Meetings & Events Centre the ultimate venue for everything from business meetings and seminars, to largescale conferences and receptions. Our dedicated Corporate and Conferencing Team will ensure that your event is an unrivalled success in the most unique of sporting and cultural surroundings. Thomond Suite features glass facades providing natural daylight with panoramic views of the stadium and pitch. This suite also has its own entrance with space for registration and reception areas. All suites have inbuilt state-of-the-art audio-visual systems for any display and technological requirements. Our catering partner, Masterchefs Hospitality, is one of Ireland’s leading corporate and event catering companies. Their experienced chefs offer mouth-watering menus, and their highly trained and dedicated team provide a personal and professional service from start to finish, ensuring that your event will be a truly memorable occasion.